Posted January 5, 2014 by Norburn Lighting and Bath Centre & filed under Bath Accessories, Bathroom Lighting . As a leading authority in grooming and bathroom storage, Robern continues to expand its offering of modular lighting solutions to integrate with its existing mirrored cabinets . With the Robern M Series mirrored cabinet, you can heighten the functionality of your bathroom cabinetry without sacrificing style. This unique medicine cabinet with night light features an integrated LED light source concealed in the finger pull of the door. The soft glow produced is adequate to illuminate any routine bathroom activity, but is subtle enough for sensitive eyes in the evening. A light sensor can detect low-light conditions and will automatically activate the night light, unless the convenient manual controller is selected. 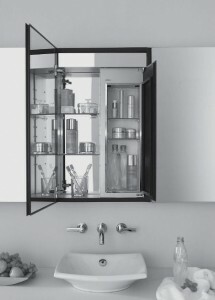 The sleek cabinet is 23-1/4″W x 39-3/8″H x 4″D and has a low-profile mirrored door that enhances its modern aesthetic. Robern. Visit our showroom at 4600 Hastings Street in Burnaby and learn more about Robern Medicine Cabinets. Norburn Lighting the Authority on Lighting in Vancouver.